It’s the festive season; the malls and markets are crowded and you jostle through the masses while juggling your countless bags and keeping an eye on your children. Parking is miles away and you snake your way through the traffic snarl ups. You’ve made your choice and reach for your wallet but it’s not there, gone, cards, cash, ID all gone. Suddenly your mobile phone keeps buzzing, you check it and realise that your credit card has been charged for large sums. You could’ve sworn you had parked the car in the correct parking area but it’s vanished, the cops have no idea and you find yourself stranded. Sounds like someone with all the bad luck in the world, but that’s not so; speak to the authorities, shopkeepers and individuals, and they’ll tell you countless such stories. Shopping can be an ordeal given the difficulty with accessible parking, overcrowding, ATM’s being out of order. Car break-in/robberies, ATM crime, pick-pocketing, mobile snatching, all rises during the peak shopping seasons. Women only markets are also not secure as many a female criminals have been arrested in the past while targeting their victims. The authorities realise the situation and make special arrangements for major shopping areas; however, the criminals also change their game plan and adapt. In such a situation you have to take measures for your own security. The first rule of security is to make yourself a difficult target, make the criminal think twice and they’ll probably move on to an easier mark. — Keep your expensive purchases for last so that you can leave for home immediately after The method you choose to pay for your purchases also affects your risk. While cash is universally accepted, more and more merchants accept debit and credit cards. As a shopper you generally have an idea of what you’ll be buying and from where. Knowing if the merchant accepts cards over cash will enable you to limit the amount of cash you must carry. In case you do need cash then knowledge of the nearest secure ATM will be helpful. Remember: A secure or regular parking spot will be well lit and patrolled by authorities thereby reducing the chances of muggings. — If possible, call ahead and have someone waiting to help you take your items from the car or to open the gate to allow you to quickly park and secure your vehicle. 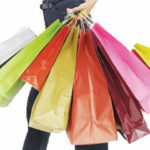 Shopping should be fun for all; some preplanning will significantly improve the experience. Stay safe out there. ← Are you prepared for Emergencies? Do you have a Grab-Bag?